Learn about the career of a dairy farmer with this coloring page. If your child has aspirations of farm life, print out this worksheet. Kids may learn about a new career, and they'll be inspired to dream big. Try this dairy farmer coloring page with your child. Click HereFor more career coloring pages. Practise Addition with Ted the Farmer! 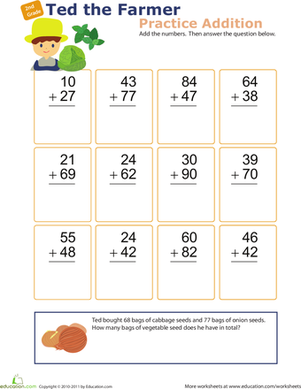 If your little mathematician helps out Ted the Farmer, he'll get some great addition practise as he assists a friend. Take a shot at coloring this goalkeeper coloring page that features hardworking athlete, Tim Howard. This phoenix coloring page depicts the creature from Greek mythology and Western folklore. Try our phoenix coloring page to learn about mythological creatures. This Minotaur coloring page features the creature from Greek mythology that is part man and part bull. Try our Minotaur coloring page with your child. This centaur coloring page is a great way to introduce kids to Greek mythology. The centaur coloring page depicts a mythological half-man, half-horse creature. Check out the big and bright sunfish in this coloring page. Encourage your child to think of careers even while having fun coloring. Start with a firefighter coloring page!